Nancy and Timo: Happy New Year! We didn't do anything particular on Christmas. Just the regular life except enjoying the days off. Actually, on Boxing day we did something special. It had been quite hot and humid whole December so we decided to improve insulation of our roof by buying some glass-wool and placing it into the attic. We drove to the local Bunnings warehouse and got some wool with aluminium foil. Luckily it started raining when we drove home. The rain cooled the roof so it wasn't so hot in the attic to put the wool in place. Anyway it wasn't an easy job. 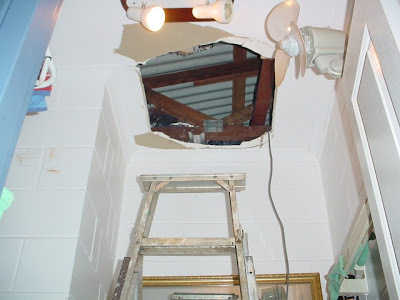 There was only very little space in the attic to go in. Nancy managed to do it and spread the stuff there. Though it wasn't easy. We could have let a professional do the insulation but at the moment, in the middle of the construction boom, it's almost impossible to get anybody to do anything. Actually it wasn't totally our fault. Our electrician had made some damages around the man hole when he was connection the rangehood. Now the cyproc board gave in too easily causing the man hole frame to fall down and tear the surrounding board. Just need to find somebody to make a properly supported man hole for us. 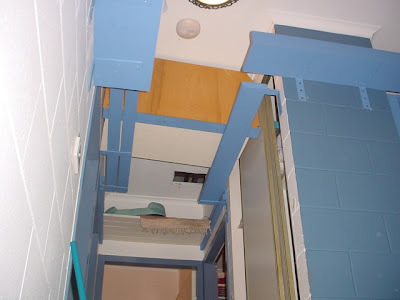 And there is still the cats' (mainly Lolitha's) hiding place waiting for the hole to the attic to be covered or a special cat door to be built. Between Christmas and New Year we got some nice and cool rain. It brought a few green frogs. A tiny one was climbing our our front door window. 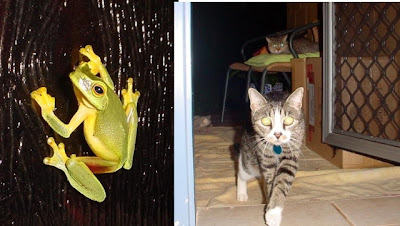 The cat on the right, our Spartacus, wasn't interested in the frog but just wanted to come in, ie. the door to be kept open for him while he was contemplating whether he really wants to come or not. We got a visitor from Europe. On New Year's Eve Timo and her made a train trip to Kuranda. 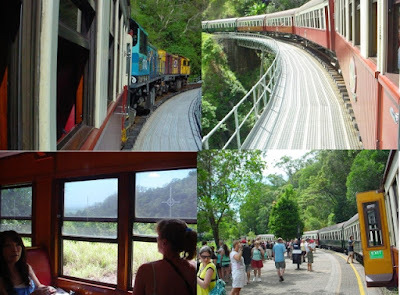 The Kuranda Scenic Railway was really an adventure for Timo who loves bot trains and mountains (and does not like the sea or boats). We could see our neighbourhood, Caravonica, from high up the mountains. Here you can the Barron river going down towards the hydro electric station and from there to the walley. Our house is on foot of the mountain, not far away from the spot where you can see 3 artificial lakes. Lakes belong to the park were we walk our dogs. Further, in the horizon to the left of the mountains you can imagine the Cairns airport and behind it Machans beach, the village where we used to live from 2005 to 2006. 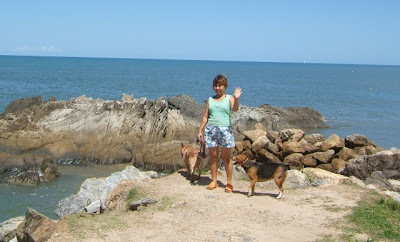 Nancy drove to Kuranda by car and met us there. We were walking around the Kuranda village with lots of other tourists. 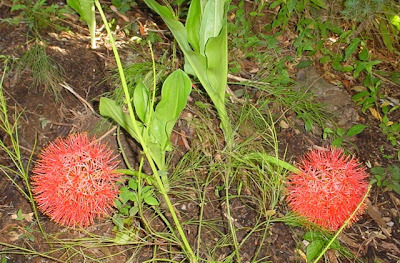 Then we drove to Mareeba where we bought some lychees and drove to a creek to eat them. We also visited the place where our coffee is being roasted, and at least partly also grown. It's called Mareeba CoffeeWorks. We usually buy their coffee on Rusty's markets. Timo keeps the beans in the freezer and grinds them as needed. In Kuranda it's cooler than in Cairns. The topic "could we move to Kuranda" is being discussed in our house. Especially Timo's dream is to be able to live in the countryside where there would be enought space for all of us, animals included. 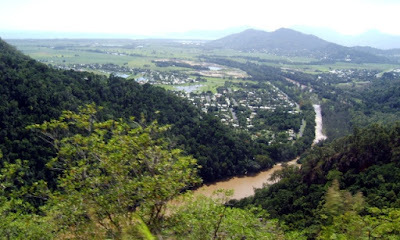 Mareeba is cool too since it's close to 400 metres above the sea level. Mareeba looks more plain than Kuranda and it appears to be dryer too. This is just a house that Timo saw on the road side. 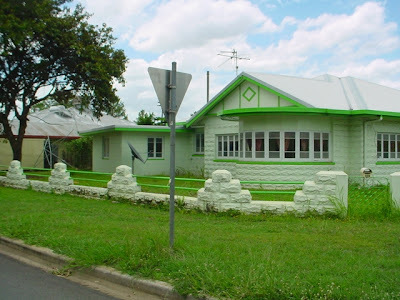 Just to show an example of older houses there. We visited the family of Timo's former colleague and for the evening we drove back home. These two photos courtesy of Annelies, our visitor. They went with Nancy and the dogs to the beach. See the fenced swimming area on the beach. 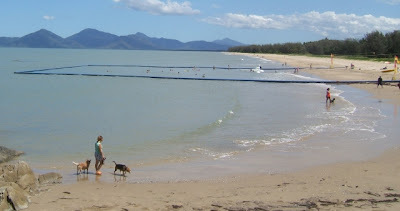 They build protected area like this on the beaches because of poisoneous and deadly marine stingers like irukandji. They also had spotted a saltwater crocodile on this beach recently. Despite lots of Timo's unfinished landscaping project, the garden is still alive and produces aside some green herbs and vegetables, also beautiful flowers. Some of them we even can't name. like this one. Below you can see one of the digging projects. 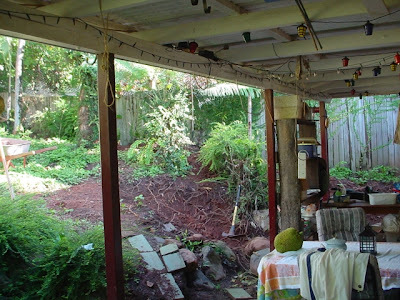 Timo's first aim is to push the slope behind the backyard a bit backwards to make it a more open space, to keep plantation away from the house so that snakes wouldn't hide in the busheds. Also need to improve drainage, ie. stop water from flooding into the back terrace. Longer term project is to dig a hole to landscape an area for a small swimming pool or above-ground spa, and sauna for Timo. 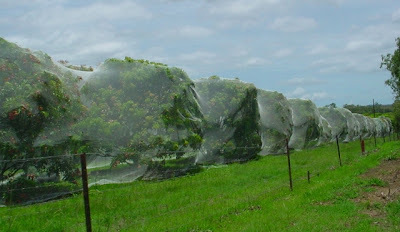 He is making the area near fence line higher and planting lots of trees and bushes there. Who knows how many years it will take. The soil is very hard and full of tree roots. Digging is possible only after rain. Then the soil (red clay) is soft but very heavy.